The Mexican supplier association INA expects up to three years of growth for its members from Chrysler's assembly of the Fiat 500 in Toluca, Mexico. TOLUCA, Mexico -- Auto suppliers in this country are welcoming Chrysler Group's announcement of a $550 million investment in Mexico to assemble the compact Fiat 500 for the United States and Latin America. "It will bring in more market for us over the next two or three years," said Agustin Rios, president of INA, the Mexican national suppliers association. INA members' sales will total an estimated $48.5 billion this year, up from $41.5 billion in 2009, Rios said. He said Mexico's suppliers are benefiting from a euro that's stronger than the U.S. dollar and Mexican peso. With financial backing from the Mexican government, Chrysler plans to retool its Toluca production site, 40 miles west of Mexico City, and start production of the small car in December, Fiat S.p.A. and Chrysler CEO Sergio Marchionne said here last month. 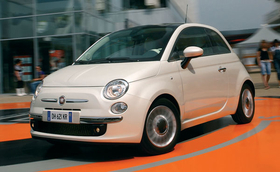 Chrysler and Fiat plan to build up to 130,000 Fiat 500s in Toluca in 2011, say Chrysler officials in Mexico. Joseph ChamaSrour, CEO of Chrysler de Mexico, said half of the vehicles will be sold as Fiat models at Chrysler dealerships in the United States. The rest will be for Latin America, particularly Brazil. The automaker already assembles the Chrysler PT Cruiser wagon and Dodge Journey crossover in Toluca. Suppliers relish the opportunity for new business. "Air Design is looking to work closely with Fiat regarding their special-edition series," said Miguel Avalos Sartorio, director of Air Design S.A. de C.V., a manufacturer of automotive exterior accessories that's based in Cuernavaca, south of the Mexican capital. Air Design manufactures lightweight plastic parts, including spoilers and cargo boxes, for many auto brands in Mexico, including Mitsubishi, Volkswagen, Seat, Chevrolet, Nissan, Renault, Ford and Lincoln. Avalos stressed that "right now there is no official commitment" by Air Design to Chrysler or Fiat. But he said he has been in contact with executives of both companies. Last year Air Design signed a deal with Italian interior automotive accessories supplier Sparco S.p.A. -- like Fiat based in Turin, Italy -- to distribute Sparco's products on Mexico's automotive aftermarket. Sparco produces seats for such European luxury marques as Ferrari, which is 85 percent owned by Fiat Group, as well as for Lamborghini and Bentley.